Ocean Medical was the first multi-disciplinary medical clinic on the North Shore. We were founded in 1999 on the belief that control over healthcare should be in the hands of the patient, not the healthcare system. Our clinic offers a wide range of services which include, but not limited to: family practice, walk-in service and non-emergency healthcare, and cosmetic therapy. With no appointment necessary, Ocean Medical caters to the whole family from newborns to seniors. 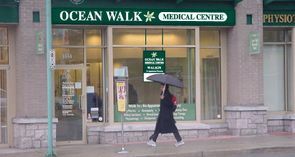 Ocean Medical is associated with Azalea Physiotherapy and Massage and Ocean Pharmacy. Other associates offer services from massage and acupuncture to cosmetic therapy. We can recommend you to one of our associations if necessary. Ocean Medical recently added Telehealth Services to our list of healthcare options. Our Telehealth Service offers chronic disease management, complex care monitoring, and health and wellness consulting provided by our team of Allied Health Care Professionals. Visit the Treatment™ website for additional information on Telehealth Services.